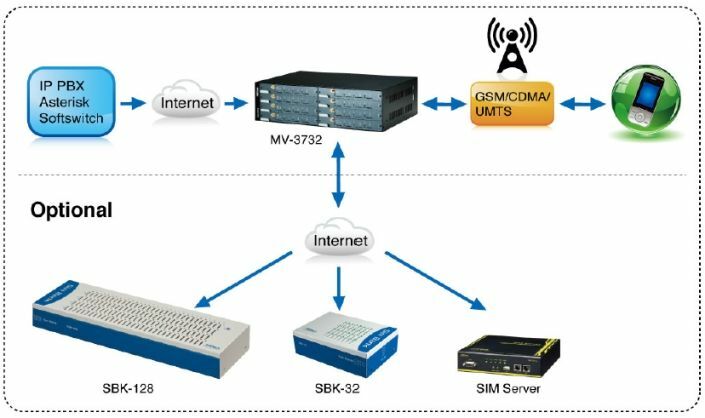 MV-3716 is a 16 channels VoIP GSM/UMTS Gateway for call termination (VoIP to GSM/UMTS ) and origination ( GSM/UMTS to VoIP). It is SIP based and compatible with Asterisk,Trixbox,3CX,SIP Proxy Server,VoipBuster. It can enable to make 16 calls simultaneously from IP phones to GSM/UMTS networks and GSM/UMTS networks to IP phone.